Top L-R: Make Up For Ever HD Kabuki Brush, Sonia Kashuk Powder/Blush Brush, MAC 129 Powder/Blush Brush, Sigma F40 Large Angled Contour Brush. Brushes are essential in creating flawless makeup looks, natural or dramatic. They also make makeup applications cleaner, easier, and more precise. Today I wanted to share with you my current face brushes, particularly powder, blush, and contour brushes. I got this from MUFE complexion starter kit. Extra-thin and soft nylon brush. It's dense and designed to apply ultra-fine HD powder. Great quality brush. The bristles are incredibly soft. I mainly use this to apply powder to set my makeup. It made the application like a dream. Big love! I got this from a set, too. This brush is nice and soft. I like to use this for blush because the size is perfect. It's also wonderful for powder. This is my oldest brush. I had this for 9~10 years?! Money well spent! This is a multitasking brush to me, I use this brush for blush, highlighter, or powder. It blends out beautifully. The brush shape is similar to Sonia Kashuk powder/blush brush above, but a tad bit more tapered. From Sigma Make Me Classy Kit. I liked that the bristles are white, and the size is perfect for cheek contour, but other than that, I found myself rarely reach for this contour brush. I don't have other similar angled contour brush for comparison, but I found my F40 to be flimsy. It's not a horrible brush though, I can still use it if my other contour brushes are dirty, just but not my favorite for contouring. From Ecotools 6 piece set. 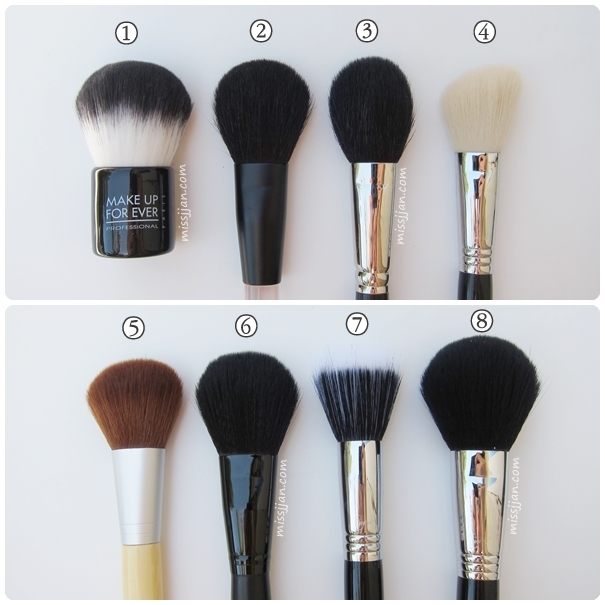 I love using this brush for bronzers, and sometimes for powder to set my makeup. I don't use it for blush, well, rarely, simply because the size is too big for my liking. I prefer MAC 129 or Sonia Kashuk powder/blush brush for blush. The bristles of this Ecotools bamboo blush brush are dense, but not so fluffy. It doesn't pick up much color and so it's great for bronzers so I can lightly and slowly add on colors. Got this from Target. For $3, this brush is a great steal! The bristles are very soft, but not as dense as Ecotools blush brush. I like to use it for powder all over my face. It's also great for large area contouring. From Sigma Make Me Classy Kit. This duo fiber flat top brush is good for creating airbrush-like effect. It's also great for applying very pigmented products/blushes. I got this from Sigma Make Me Classy Kit. This brush is big, soft, and fluffy. I mainly use this brush for powder. It's a nice brush, though I won't buy it individually. e.l.f. Studio Complexion Brush will do the job just as well as this one in my opinion! Picture above is the overview of all the face brushes so you can see the sizes, lengths and handles etc. Readers, do you love brushes? 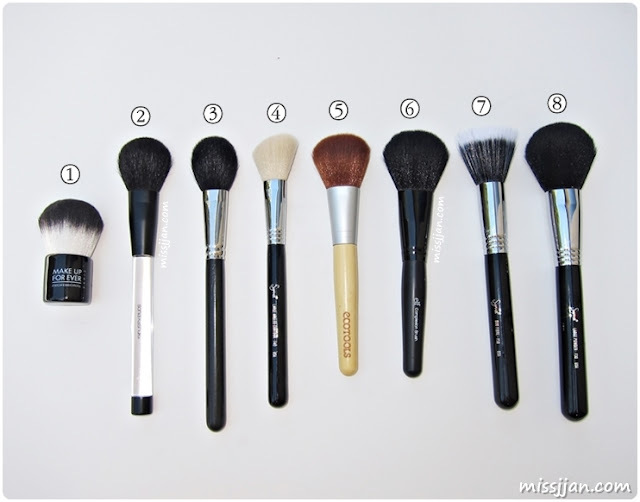 what are your favorite face brushes?